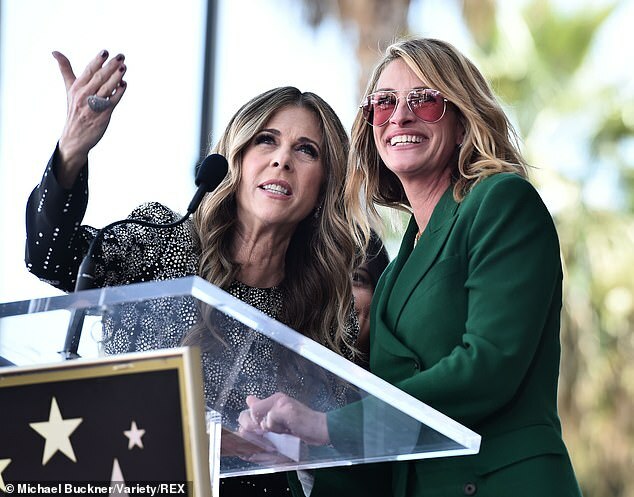 Julia Roberts made quite the impression on Friday when she showed up to the Walk Of Fame ceremony for actress and singer Rita Wilson. 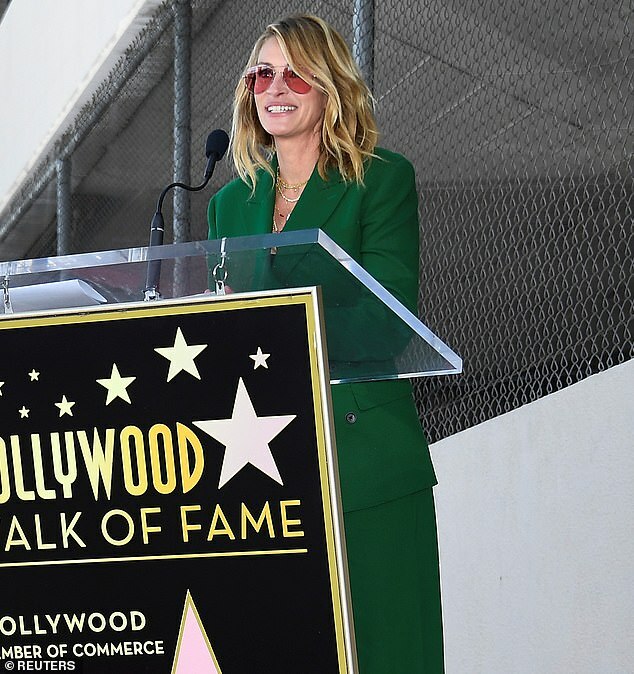 The Oscar-winning star wore a green suit and rose-tinted glasses as she delivered a heartfelt speech for the wife of Tom Hanks. Also on Friday Rita’s album Halfway To Home drops. 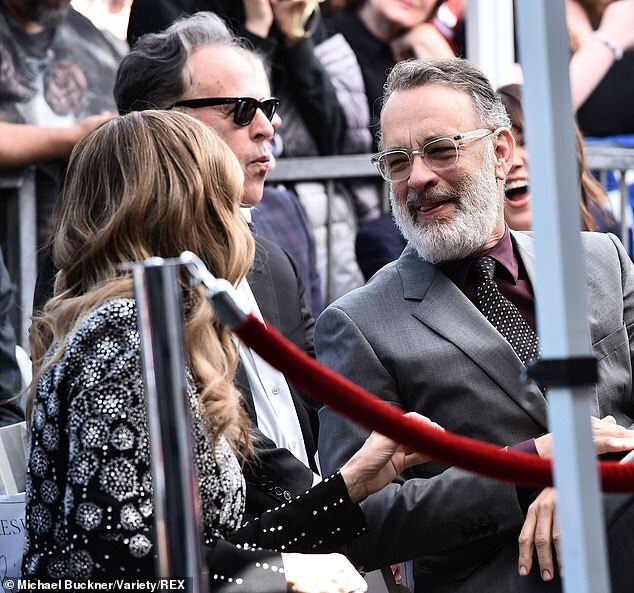 Rita, Tom and Julia all worked together on the 2011 movie Larry Crowne. Wilson looked pretty in black and silver dress with her hair down in soft curls. She laughed as the Pretty Woman star spoke. 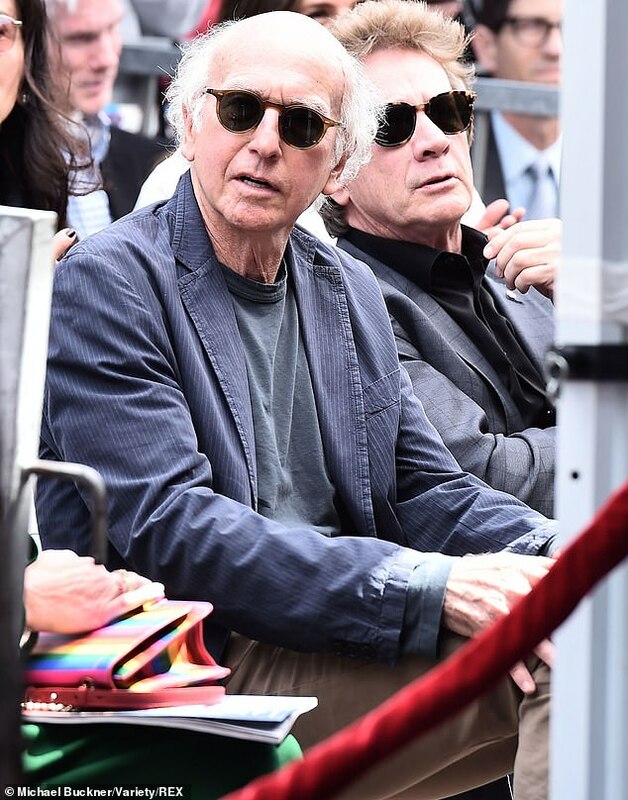 ‘I think, for me, it’s always about having family and friends, and you can see by the people that are here, I have all my family and my friends, so having Julia and of course, my husband Tom, whose star is just over there, it’s a fantasy come true. Also at the event were Rita’s sons Chet, 28, and Truman, 23. And Chet’s daughter also made the ceremony, looking cute in a pink dress. Tom’s daughter Elizabeth Ann Hanks from his first wife Samantha Lewes wore a white dress. Hanks’ first son Colin Hanks was not seen. 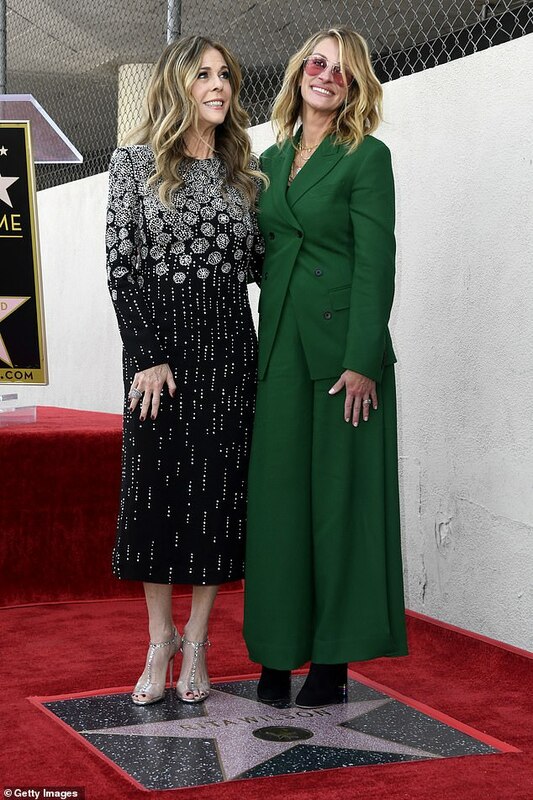 Wilson told Variety that she ‘almost fell over’ when she learned she would get a star on the Walk of Fame. The honor has special meaning for Wilson, who was born and raised in Hollywood. ‘My first thought went to my parents and I thought, “Oh my God, if they were alive they would be so happy,”‘ she said. The star is also just four spots away from her husband Tom’s star. ‘My parents came to L.A. because my mom’s sister lived here and the weather was better than in New York,’ Wilson said. 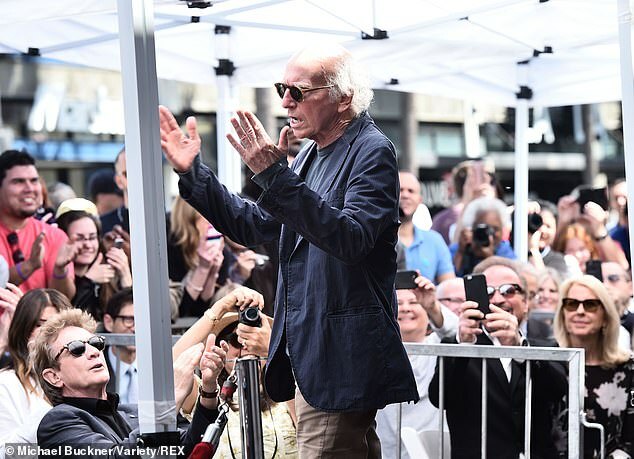 ‘So they didn’t have that sort of reverence for Hollywood some people did. 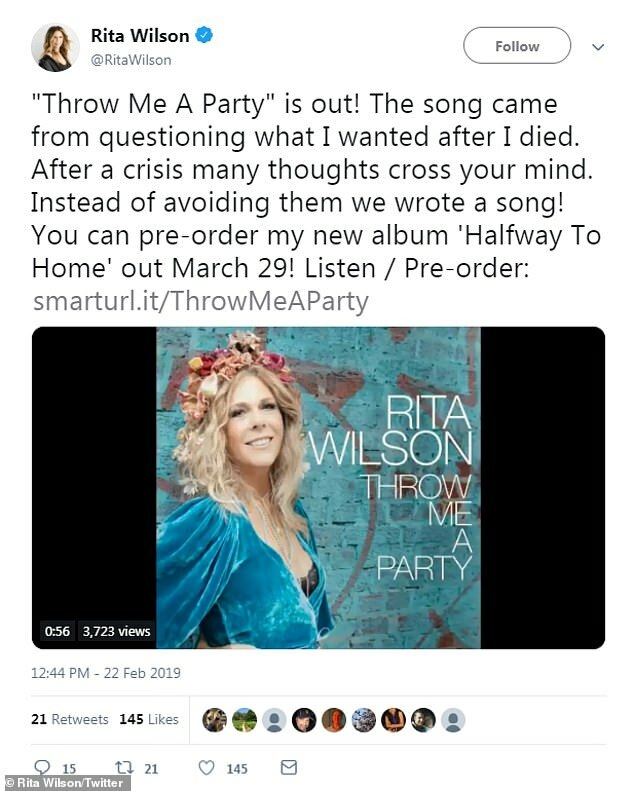 On Tuesday the 62-year-old Sleepless In Seattle actress – who recently released the song Throw Me A Party – shared a tweet as she looked back on some of her darker days. ‘Four years ago when I was diagnosed with breast cancer, I had so many different thoughts,’ she said. The star did not add any more text but posted a photo of her and Hanks looking happy at a party. He had on a suit and she looked slender and tan in a red dress. Wilson revealed in 2015 that she was diagnosed with breast cancer and had undergone a double mastectomy and reconstructive surgery. Shared the news through a statement published by People magazine. Rita explained that her first test for cancer came back negative but that she was correctly diagnosed after seeking a second opinion and underwent the procedure . ‘Last week, with my husband by my side, and with the love and support of family and friends, I underwent a bilateral mastectomy and reconstruction for breast cancer after a diagnosis of invasive lobular carcinoma,’ she said in the statement. Before the diagnosis, Wilson said she had ‘vigilantly monitored’ her health with mammograms and MRIs because she knew she had an underlying condition of LCIS, (lobular carcinoma in situ)’. The mother-of-two explained that she underwent a breast biopsy, but no sign of cancer was discovered until she sought the opinion of a second doctor on the advice of a friend. The doctor discovered the cancer and she then sought out the opinion of another pathologist, who confirmed the diagnosis, she said. 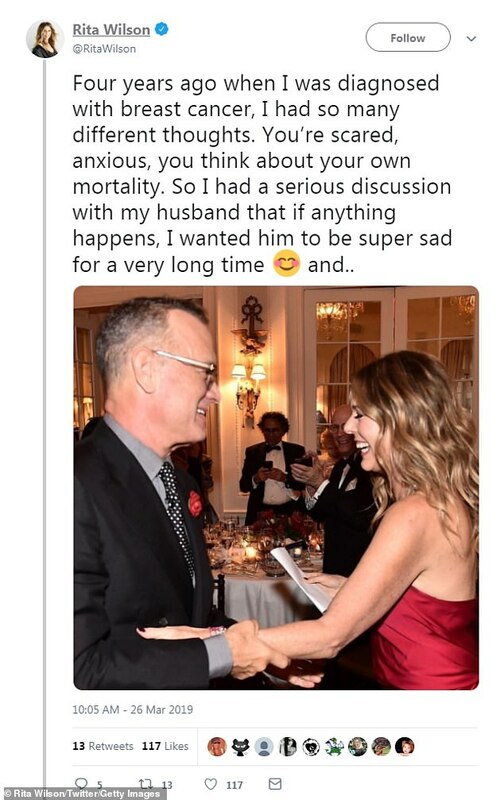 Rita, who married Oscar-winner Tom in 1988, went on to implore others to seek a second opinion before thanking her loved ones for their support. ‘I share this to educate others that a second opinion is critical to your health,’ she said. On Facebook, she encouraged other women to seek a ‘necessary and vital’ second opinion if they found themselves in similar situations. Wilson is also known as the mother of Marnie, played by Allison Williams, in HBO’s Girls. The star has focused on her singing career in recent years. Her new album Halfway To Home comes out March 29. 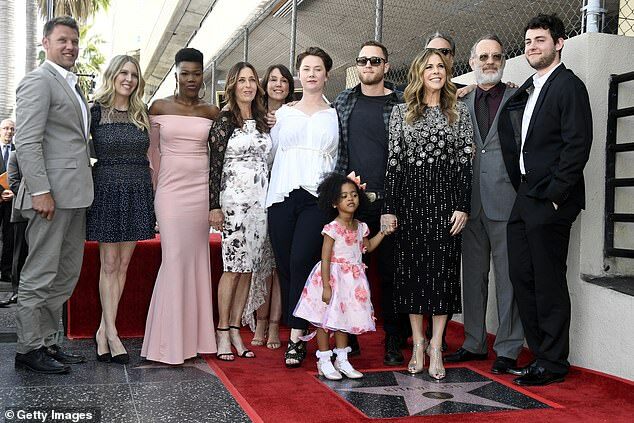 She has two sons with Hanks, Chester Marlon, 24, and Truman Theodore, 19, as well as two stepchildren from Hanks’ previous marriage – actor Colin Hanks, 37, and writer Elizabeth, 32 – to whom Wilson is close. 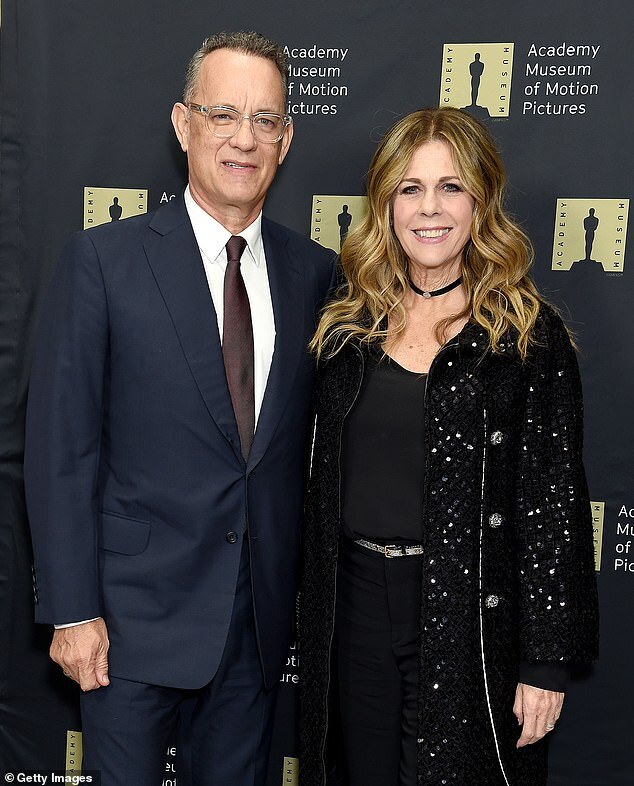 Hanks and their mother, Samantha Lewes, had met in college but divorced in 1987, the year before he married Wilson. Lewes passed away in 2002, when she was just 49, after battling bone cancer.